If you want to be muscular, lean, and strong as quickly as possible without steroids, good genetics, or wasting ridiculous amounts of time in the gym and money on supplements…then you want to buy this transformation package. You don’t need to constantly change up your exercise routines to “confuse” your muscles. You don't need to spend a couple of hours every day doing workouts you hate, beating yourself into a pulp with tons of sets, supersets, drop sets, etc. You don't need "clean eating" to get ripped and you don't need to avoid "cheat" foods while getting down to single-digit body fat percentages. Those are just a few of the harmful lies and myths that keep guys like you from ever achieving the lean, muscular, strong, and healthy body you truly desire. The exact methods of diet and training and the supplements that make putting on 10 to 15 pounds of quality lean mass a breeze while significantly reducing your body fat percentage...and it only takes 10 to 12 weeks. Well, all than can be yours, and we’re going to show you how. Buy this transformation package now and begin your journey to a bigger, leaner, and stronger you! Bigger Leaner Stronger was published in 2012 and has quickly become one of the most popular fitness books of all time, with over 200,000 copies already sold. How to lose fat and build muscle eating all the foods you love...without ever feeling starved, deprived, or like you're "on a diet." An all-in-one bodybuilding routine that will give you a big, full chest…a wide, tapered back…bulging arms…and thick, powerful legs...in just 3 to 6 hours of exercise per week...doing weight training workouts that you actually look forward to. How to master the "inner game" of fitness and develop the self-discipline you need to build the body of your dreams. Why pre- and post-workout nutrition is important and how to use these “feeding windows” to accelerate your gains in the gym. With this book you'll also get a free 98-page bonus report where you'll not only find an entire year's worth of workouts for the program plus the author’s personal product recommendations and more! The bottom line is you CAN achieve that “Hollywood hunk” body without having your life revolve around it—no long hours in the gym, no starving yourself, no grueling cardio that turns your stomach...and this book will show you how! Do you lack confidence in the kitchen and think that you just can’t cook great food? Are you not sure of how to prepare food that is not only delicious and healthy but also effective in helping you build muscle and lose fat? Are you afraid that cooking nutritious, restaurant-quality meals is too time-consuming and expensive? Do you think that eating healthy means having to force down the same boring, bland food every day? If you answered “yes” to any of those questions, then you need The Shredded Chef. How to use “flexible dieting” to make effective and enjoyable meal plans for building muscle, losing fat, and staying healthy. Flexible dieting is exploding in popularity and for good reason, and in this book, you’ll learn everything you need to know to make it work for you. How to eat right without obsessing over every calorie. Calorie tracking is a great tool for improving body composition but isn’t necessarily something you want to do every day for the rest of your life. And you don’t have to if you follow the 5 eating principles discussed in this book. The 12 most common cooking mistakes that turn even the best recipes into “blah” food. If you’re making some of these mistakes too (I sure did before I learned the fundamentals of good cooking), I can guarantee you’ll always struggle to make outstanding food...even when you think you’re following recipes exactly. Which foods are actually worth buying organic (if your budget permits) and which aren’t, and why. You’re going to learn what the science says about the benefits and disadvantages of organic food, and what it means for your health. How to use simple seasonings like salt, acids, herbs, and spices to turn bland meals into exquisite fare. Many people don’t realize just how much simple seasoning techniques can improve the taste of foods! How to buy, store, and cook fish, meat, and poultry for maximum flavor, value, and health. Excellent food starts with excellent ingredients, and how you choose, store, and cook your fish, meats, and poultry plays a major role in how much you enjoy them in your mouth. The kitchen equipment worth buying and what to skip, and how to to keep your utensils in top condition. What types of knives do you really need and why? And how do you take care of them? What about pots and pans? Which are best? And food scales? Measuring cups and spoons? Are any other kitchen knick-knacks and fancy gadgets really necessary? It’s all here! This book also comes with a free spreadsheet that lists every recipe in the book along with their calories, protein, carbs, and fats, which makes it easy to include recipes in your meal plans! What types of food come to mind when I say “diet”? Unappetizing bowls of microwaved oatmeal? Well, it doesn’t have to be like that. When you know how to diet properly--and this doesn’t mean learning to eat boiled chicken and raw broccoli six times per day--getting lean becomes simple, convenient, and dare I say...enjoyable. All these “fantasies” can be a reality, and these meal plans will help you get there. 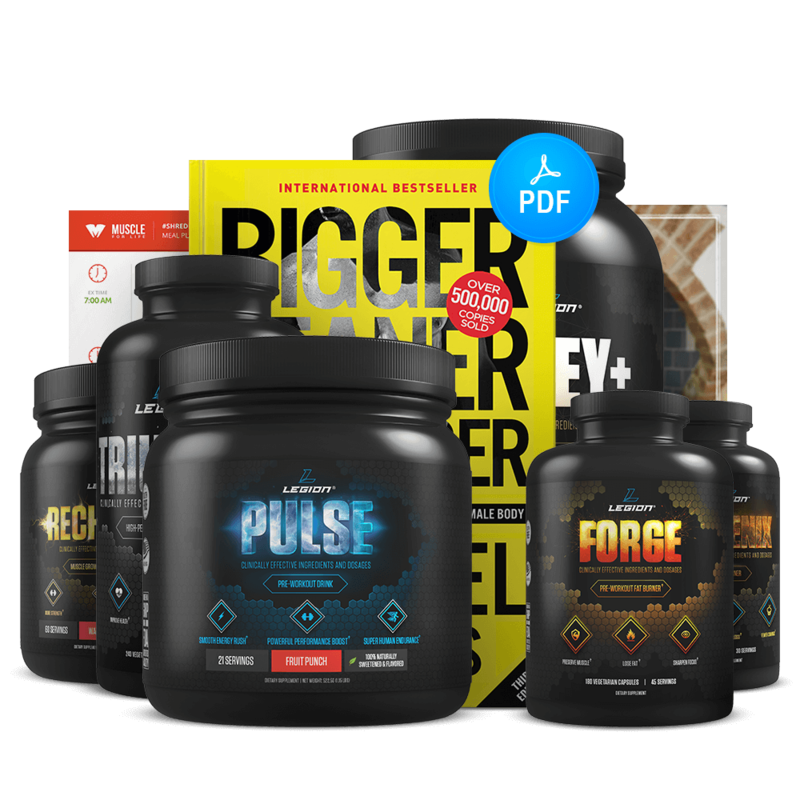 When you buy this stack, you’ll also get 20 meal plans created by my team that has made over 5,000 meal plans for men and women of all ages, sizes, and circumstances. You’ll get 10 “aggressive fat loss” meal plans designed to help you lose fat rapidly...not muscle. The two most common cutting mistakes people make are eating too much and eating too little. Eat too much and you’ll fail to lose fat at any significant rate. Eat too little and you’ll lose fat but you’ll also lose a significant amount of muscle as well. The name of the game is finding the “sweet spot” where you can lose fat rapidly without losing muscle, and that’s where these meal plans can help. Regardless of your current weight and goal, there’s a meal plan for you that utilizes an aggressive (but not reckless) calorie deficit to drive fat loss as well as high protein and carbohydrate intake to preserve muscle and strength. They also contain a variety of enjoyable foods that help blunt hunger, control cravings, and prevent micronutrient deficiencies. You’ll also get 10 “lean bulking” meal plans designed to help you gain maximum muscle and minimal fat. Many bulking programs are like dietary sledgehammers. They call for eating downright absurd amounts of food, which is ultimately counterproductive because you gain too much fat too quickly. Namely, it hinders muscle growth, accelerates fat storage, and makes undoing the weight gain even harder. Well, bulking properly doesn’t require eating nearly as much as you might think, and these meal plans will show you how to do it right. They were made for guys of all weight ranges and contain foods that are not only delicious but are particularly good for clean bulking like. So, whether you want to bulk or cut, simply pick the meal plan that’s closest to your weight and that best fits your training schedule and dietary preferences, follow it every day, and you’ll be on your way to building your best body ever. Whey protein is extremely popular for several reasons: you get a lot of protein per serving, it tastes good, and its amino acid profile is particularly suited to improving muscle definition. And if you’re looking for a natural whey protein, WHEY+ is hard to beat. It’s 100% whey protein isolate. It contains no soy protein, gluten, GMOs, MSG, or hormones. Once you’ve trained your muscles, it’s time to recover and grow, and that’s exactly what RECHARGE was created for. It contains three molecules scientifically proven to help you build muscle tone faster, get stronger, recover faster from workouts, and reduce muscle soreness: creatine monohydrate, L-carnitine L-tartrate, and corosolic acid. With RECHARGE, you’ll be able to get stronger, train more frequently, build more muscle definition, and recover better. TRIUMPH’s formulation does a lot more than plug potential holes in your diet. It contains a unique combination of 35 ingredients scientifically proven to improve health and well-being, enhance physical and mental performance, and protect against disease. If you want to prevent nutrient deficiencies and be healthier and more resistant to stress and sickness...and if you want to have the energy to train hard and feel great physically and mentally...then you want to try TRIUMPH today. Whey protein powder can be used anytime to help you meet your protein needs, but the ideal ratio between whole food and supplemental protein is still an area of scientific ambiguity. Anecdotal evidence, however, suggests that getting at least 50% of your daily protein from whole food sources is a good rule of thumb for the purposes of healthy dieting. Whey protein powder is particularly effective when eaten after training due to its rapid digestion and abundance of leucine. Simply put, the faster protein is digested and the more leucine it has, the more muscle growth it stimulates. This is why research has proven that whey is a highly effective form of post-workout protein. And this is why we recommend that you have one to two scoops of WHEY+ after your workouts, which will provide your body with a large enough dose of protein to maximize muscle protein synthesis. Depending on when you train, you may benefit from having whey protein before you work out as well. Studies have shown that eating protein before training both does and doesn’t enhance post-workout muscle growth, which leaves many people scratching their heads. Well, an important factor to consider is when study subjects had last eaten protein before eating their pre-workout meals. You see, when you eat a meal, it takes your body anywhere from 2 to 6 hours to fully absorb the nutrients it provides. Thus, if you had eaten a meal with a considerable amount of protein just an hour or two before working out, your plasma amino acid levels (the levels in your blood) would be quite high come workout time. When this is the case, it’s unlikely that eating more protein before working out would help you build more muscle. In this case, research shows that eating protein (and thus elevating plasma amino acid levels) before training can help you build muscle faster. This is why we recommend that you have one scoop of WHEY+ before your workouts if you haven’t eaten at least 20 grams of protein within the previous two hours. RECHARGE is best taken after workouts with your post-workout meals, which would ideally contain both protein and carbohydrates. The reason for this is research shows that creatine is most effective when taken after workouts and with carbs. If, for whatever reason, that doesn’t work for you, then the second-best time to take Recharge would be with any meal containing carbs. Take RECHARGE every day, whether you train or not, to keep intramuscular creatine levels elevated. It’s worth noting that you don’t have to cycle RECHARGE. When you supplement with creatine, it’s true that your body reduces its natural production. That may sound ominous but don’t mistake creatine for steroids, which can shut down (and even permanently damage) your body’s natural production of certain hormones. Ironically, producing creatine is a demanding process and reducing this burden may even be healthful. And if you cease supplementation with creatine, your body resumes its normal production. Your body can only absorb so much of a given nutrient in one sitting. Excess amounts are disposed of in various ways. As the goal of taking a multivitamin isn’t merely ingesting nutrients but absorbing and using them, we recommend that you take ½ of a serving of TRIUMPH early in the day and another ½ of a serving 3 to 6 hours later. Most people take TRIUMPH with breakfast and dinner, and doing this ensures they’re not providing their bodies with more of any individual nutrient than they can effectively process. You can further improve absorption by taking TRIUMPH with or after meals containing dietary fat. Some of the molecules in TRIUMPH are fat soluble, meaning they are absorbed into fat, which is then transported throughout the body and utilized. Taking TRIUMPH with meals also prevents the nauseous feeling you can get when you take a potent multivitamin on an empty stomach.